I’ve continued working at Heritage and as of September, I’ve been with Heritage for 3 years. I really have no intentions of leaving Heritage anytime soon – apart from maternity leave that will begin at the end of the year. I’m continuing to work as a barista part-time while also owning my main position as the Creative Community Coordinator running the Shasta Lake Creative Community – a community development group within Heritage. Through this position I manage the Shasta Lake Certified Farmers Market, Monthly Art Rotations in the Cafe, and help facilitate other projects like the Community Garden & Special Art Shows. Aaron has been rocking it at daddy daycare! He takes care of Odette so well when I am unable – I am so happy to have a husband who is so hands on and capable to rise to this parenting task we share. Between his very important job of being an awesome dad, he’s been picking up graphic design work, going through game development courses, and creating product(beeswax wraps, reusable tea bags, & more) for our Sunday morning pop up shop at the Farmers Market I manage. Due to the increase in side work we are receiving, we are pursuing obtaining a business license and truly turning That Hipster Life into our own ‘legit’ business. – this should be happening in the next few weeks! Beyond all of THIS craziness, life circumstances has created an enormous amount of urgency for all things Tiny House related in our lives. – we have STILL not received word from the inspection company, which means we are unable to move forward on our build at this time IF we choose to get our Tiny House certified. We are considering the consequences of potentially not seeking certification as we are learning that even if we got our Tiny House Certified, under current laws, it still may not be sufficient. However, financially, we are at a point that even if we chose to move forward without pursuing Certification we must find other means to fund the finish of the build. We have requested an increase to our credit limit while seeking a viable cosigner for a personal loan if the increase does not get approved. -now however it happens, we know we must do something very soon as our current living situation is expiring and our local housing market is in complete disarray – especially due to the recent devastating fires. Outside of our personal Tiny House journey, there has been some amazing strides in the local Tiny House Movement as a whole. I recently got interviewed by KRCR about how Tiny Houses could be a solution to the housing crisis that has only gotten worse thanks to the Carr Fire. A few others in our local Tiny House group also got interviewed on the same topic by the Record Searchlight. I have been attending as many City Council meetings in Shasta Lake as I can and have recently adjusted my schedules & meetings to make it possible for me to attend all future City Council meetings. 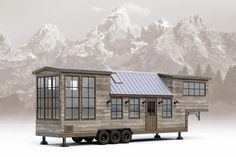 I have also been educating myself on Affordable Housing with the goal in mind to soon present proposed Tiny House Ordinance changes to the City of Shasta Lake. The day I present will be a very pivot moment for the future of our Tiny House Community. – I anticipate that this day is not as far down the road as I originally thought. As I talk with others in Shasta Lake, City Council members, and learn more about how our lack of affordable housing negatively impacts our whole community…my desire and passion for Tiny Houses amplifies! I am constantly getting in long passionate discussion about affordable housing and cant stand by any longer watching the horrible effects it as on my community – Ive committed to doing something about it. The goal at this point is to come up with the funds, whether through a credit increase, personal loan, or the miracle of money appearing in our account – finishing the build, taking an enormous amount of photos for possible later certification…but moving forward on building regardless of when the inspection company gets back to us. Temporarily moving to the RV Park in Redding that is willing to accept our Tiny House WHILE we work on changing the ordinances in the Shasta Lake. Once that is done, crafting together our Tiny House Community plan, deciding on a property, and then applying for the Government Funding/Grants of our Temporary Affordable Housing project. If approved, moving forward with property planning, infrastructure, and sourcing out Tiny House building to our builder of choice, Liberty Cabins. ALL THE WHILE, we are growing the cutest, little family ever. Odette is a little over 2 years old now and is arguably the sweetest little girl I have ever met. I get through difficult days thanks to her…she is a master cuddler & our goofy entertainment. I am 25 weeks along in my pregnancy with Archie. I am very excited to meet him and see Odette get to experience being a sister. I’m a little intimidated at the thought of raising a son but am happily taking on the challenge. We anticipate this upcoming year will be an even crazier one but are excited to see what unfolds. Thank you for being a part of our journey!